We’re standing with more than 60 independent festival across the UK in our commitment to being disposable plastic free! All participating festivals have pledged to to ban the use of plastic straws on site, and to eliminate all single use plastics on site by 2021, which is a fantastic step forward for the industry. 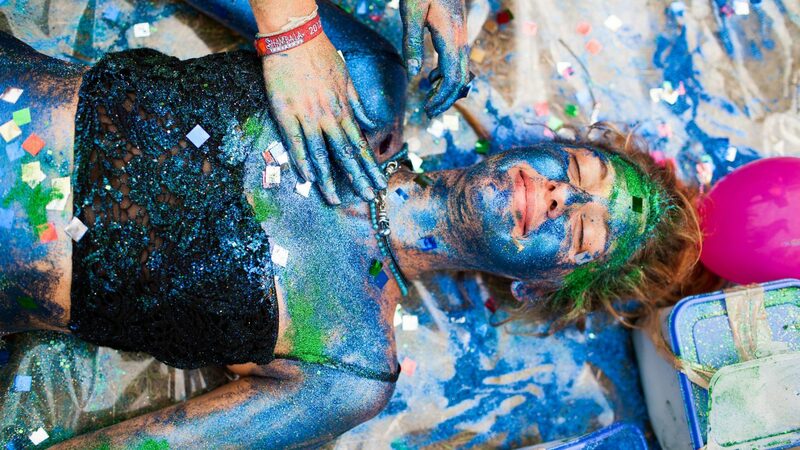 A festival without glitter? Sorry glitter junkies, we have to accept that microplastics on our land or in waterways is a problem. And the jury is out on biodegradable glitters too, as there’s no evidence that these are much better, yet. If you’re dead set on facial decoration, we recommend cracking out the face paints or embracing the Avant Garden theme with paper petals and flowers, or even making a mask. If you must use glitter, please use make up remover and a cotton pad (not a wet wipe – but that’s a whole different conversation) to wipe it off, and put it in a ‘general waste’ bin, so it doesn’t contaminate recyclable materials. We know it can be tricky rethinking everyday habits, but please have a go at our Plastic Challenge 2018. Try these 5 things to break our plastic addition and move toward reusables – it’ll make a massive difference! 1. Bring your own water bottle/drinks in metal bottles – Bring a water bottle, and wherever possible buy cans or be clever about what you bring to avoid plastic. 2. Plastic free periods! Due to be on your period at Shambala? Check out a brilliant factsheet for reusable menstrual products HERE or pop into the Red Sea Travel Agency on site for more information on making the switch. 3. Food and drink packaging – Avoid bringing ‘convenience’ food or drink that comes with unnecessary plastic packaging – those ‘snap pots’ of baked beans are a great example of packaging gone mad – embrace the humble tin. 4. Smokers – switch to biodegradable filter tips, for your roll ups. These are easily found online, from brands such as Mascotte, Nature, Raw, OCB and Swan. 5. Bring your own reusable cup or mug – plastic, bamboo or metal (no ceramic or glass for safety reasons please!) or, if you haven’t already, buy a beautiful Shambala Bamboo Ecoffee cup or steel water bottle in advance to pick up on arrival (or onsite from any cafe serving hot drinks while stocks last). You can pre-order yours now, under ‘Ancillary Items’ on our ticket page HERE. Our friends and partners at The RAW Foundation have put together a Plastic Free Guide for festival goers, packed with clever ways to help you reduce the amount of plastic you bring to site and in every day life – download it for free, HERE. And finally, this year, we’re also attempting to build the festival without traditional cable ties – gulp! – wish us luck! ON YER BIKE! EXCLUSIVE CYCLING TICKETS NOW AVAILABLE!